All is well at the zoo until walrus notices the open gate and decides to escape. 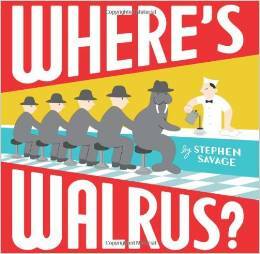 Where’s walrus now? The zookeeper frantically searches for the escaped walrus throughout town. 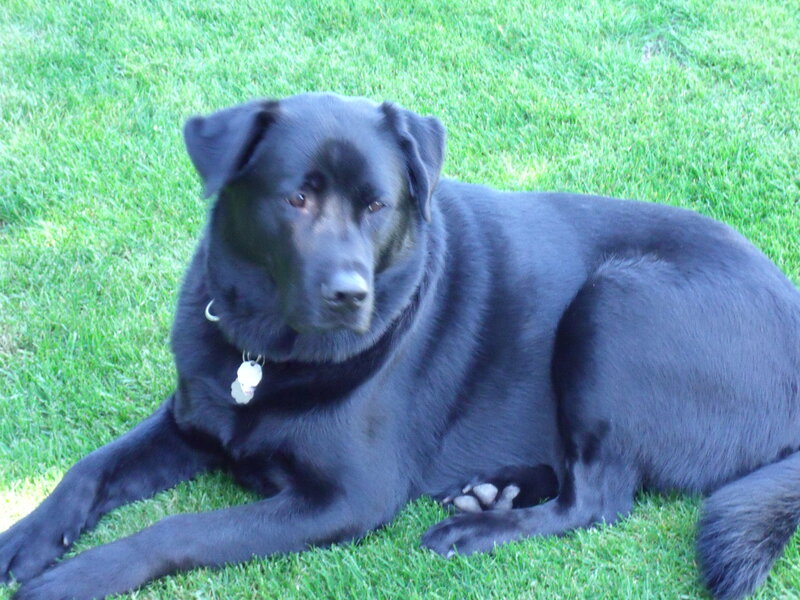 However, walrus is difficult to find as he hides by disguising himself. He blends into scenes and situations in town. A few disguises he becomes are a firefighter, artist, and even a dancer. Walrus wears different hats that match each disguise. Walrus can’t help but stand out when he discovers a pool and shows his diving skills. Is the chase off now that walrus is no longer in disguise? Where’s Walrus? 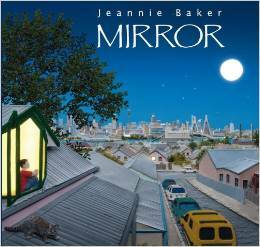 is a delightful and humorous book, especially for younger ages. The illustrations are simple with bold colors. 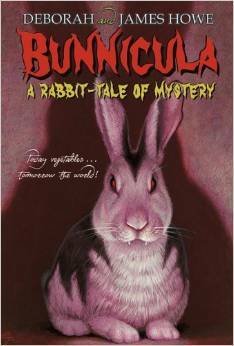 The storyline is also straightforward – animal escapes, hides, and zookeeper tries to find. Younger ages can find walrus within the pages. Where’s Walrus? is sure to get many laughs. 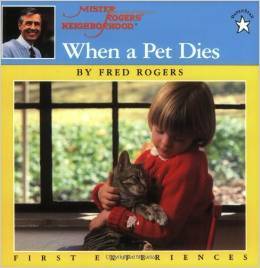 I recommend this book. 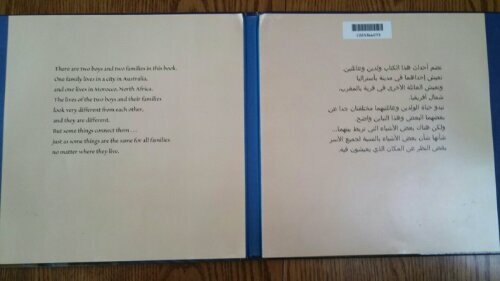 This entry was posted in Book Review, Children's Book, Wordless Picture Book and tagged Book Review, children's book, picture book, Stephen Savage, Where's Walrus?, wordless picture book. The year is 2044 and the world isn’t a pleasant place. Extreme famine, war, homelessness, and energy shortages are just a few concerns. Teenager Wade Watts’ only escape is when he’s connected to the virtual world OASIS. When he’s in OASIS, Wade can be whomever he desires, attend high school virtually, form friendships, and most importantly is in a utopia-like world. His poor living conditions may change when he learns about an OASIS contest to win billions of dollars. James Halliday, the founder of OASIS, creates a virtual treasure game to win the billions. The prize is far from an easy task to find. It is hidden within clues and puzzles. Halliday was obsessed with everything about the 1980s, so all the puzzles somehow connect to the 1980s. Wade masters all the arcade video games, movies, television shows, and anything about Halliday’s life growing up in the 1980s. Wade is the first to find a clue, but there are now challenges. He learns that some players are out to kill in order to win the prize and control the OASIS. The only way for Wade to survive is to continue playing the game. Is his 1980s knowledge enough to win? How does the real world connect to the virtual OASIS? Ready Player One was a very fun and entertaining read! If you enjoy video games, movie and television trivia, and a look back into the 1980s then you’re sure to enjoy this book. I didn’t play video games, but the terms were easy to follow. The OASIS in 2044 really doesn’t seem that far away as today in 2014. We often hide in our own ‘worlds’ behind Facebook, constant web searching, dating sites, and texting to name just a few. There’s a balance between the real world and virtual world. Wade has this same problem in Ready Player One. Let this book remind you that it’s okay to unplug ourselves from the virtual world and enjoy each other in real time. 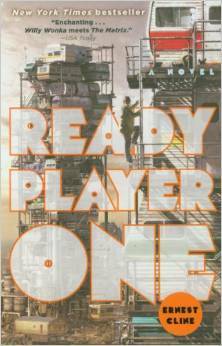 This entry was posted in Book Review, Science Fiction and tagged 1980s, Book Review, Ernest Cline, Ready Player One, science fiction, video games. Ladies, gentlemen, boys, and girls The Garibaldi Circus is coming to town! There are many busy preparations for the circus, but if you look closely you may get a sneak peek. A young girl watches across the street at the bus stop as people prepare for the upcoming circus. The girl witnesses a tight rope walker who is actually a construction worker balancing pails. She sees clowns who are kids skateboarding into the market. There’s a sword swallower sitting in the dentist chair. A stilt walker balances on a ladder while painting. A dog’s shadow becomes a scary lion. The entire street ‘circus’ is viewed on the last pages. The girl boards the bus at the same time a boy sits at the bus stop to watch. What exciting things will you see at the circus pre-show? 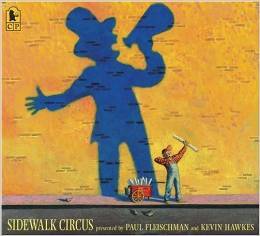 Sidewalk Circus is an entertaining book that displays ordinary street events into an exciting show. I thought it was interesting that the girl was the only individual at the bus stop who noticed the street shows. Even though this is a wordless picture book, words appear on circus posters, shops, and billboards announcing the circus. 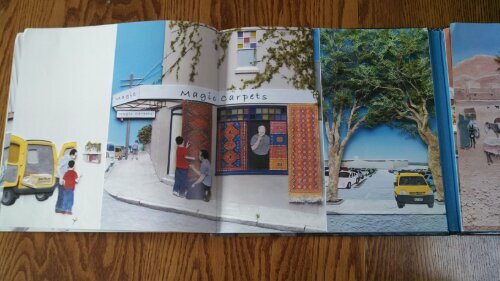 The illustrations are bright, colorful, and show city details. I recommend Sidewalk Circus to help see the extraordinary in the otherwise ordinary daily events in your city. 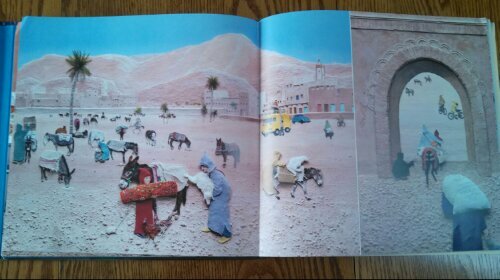 This entry was posted in Book Review, Children's Book, Wordless Picture Book and tagged Book Review, circus, Kevin Hawkes, Paul Fleischman, picture book, Sidewalk Circus, street life, wordless book, wordless picture book. Flotsam: A wreckage of a ship and its cargo found floating in the water. A curious boy explores many animals and things at the beach. An old camera with barnacles washes onto the shore and he develops the film. He discovers interesting pictures of sea creatures: An octopus reading in the living room, seastars carry islands on their back, and even small aliens surrounded by sea horses. One photo catches his eye of a girl holding a photo who is also holding a photo. The boy zooms in the photo with his microscope and discovers many children holding the photo. He then takes a photo of himself with the photo. The camera is thrown back into the water, so more photos can be taken and other children can find it on the beach. 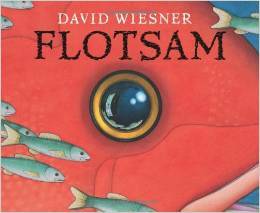 Flotsam is another beautifully illustrated book by David Wiesner. The book has realistic elements as he finds animals on the beach with fantasy elements of sea photos. 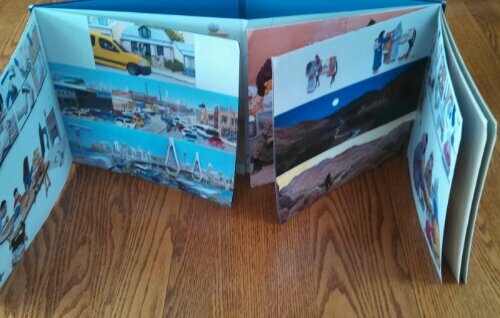 The photo pages were outlined black in the book to appear like a photo. I only had a problem with throwing the camera back into the ocean, but I understand it’s part of the story. Remind children (and adults) to keep nature clean. Spark their wonder about sea mysteries with Flotsam. 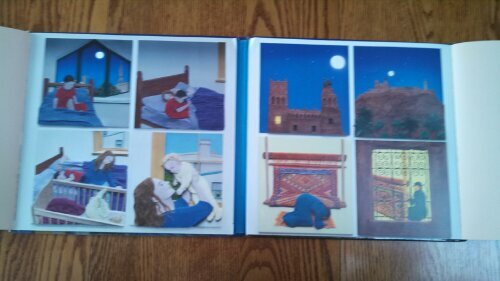 This entry was posted in Book Review, Wordless Picture Book and tagged beach, Book Review, children's book, David Wiesner, Flotsam, picture book, wordless book, wordless picture book.